A build typically consumes source code maintained in a version control system (VCS/SCM). 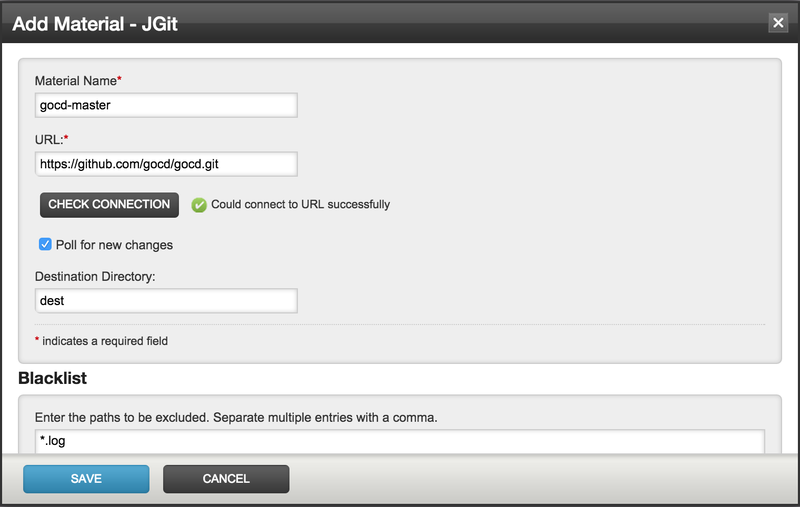 GoCD has built-in support for Git, Mercurial, SVN, TFS & Perforce. 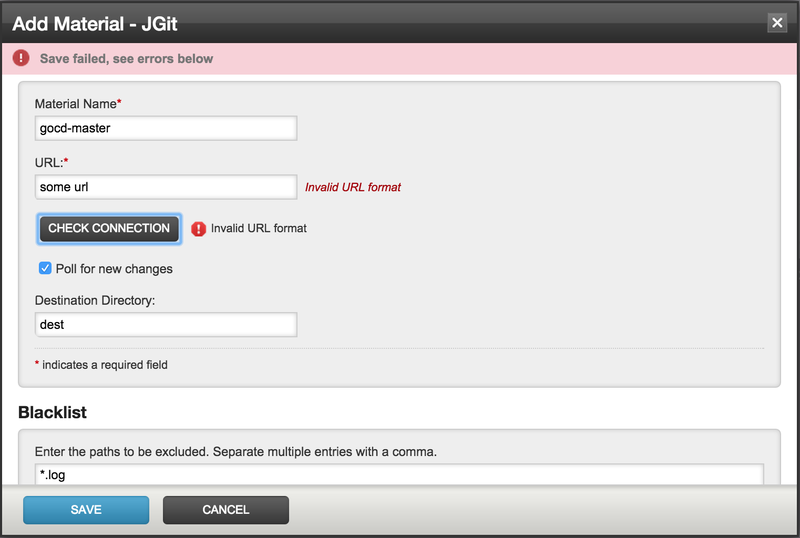 Users can use SCM plugins to integrate with other SCMs. Unlike built-in VCS/SCM materials, the material definition in case of plugin SCMs is not contained within the pipeline definition. They are global entities. Many pipelines may have material definitions referring to the same SCM. When there is a new revision in the SCM, interested pipelines will get scheduled. 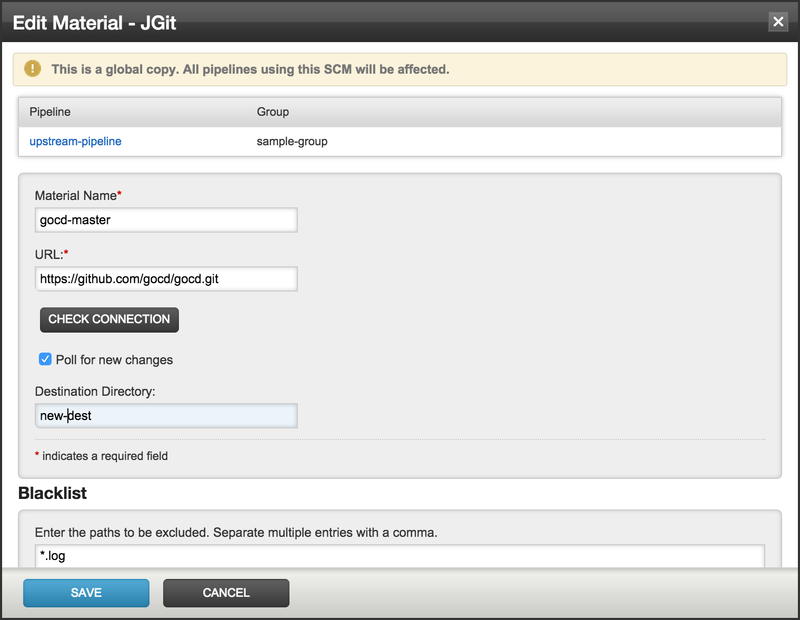 A SCM material plugin lets pipeline group admins provide details of the corresponding SCM type to GoCD. The SCM name is not used by the SCM material plugin - it is used by Go to construct the material name. Two SCMs cannot have the same name. Use the check connection button to ensure that Go can work with this SCM. On “Save” plugin validates user inputs. Note: Currently to associate an existing SCM material to a pipeline you will need to edit the Config XML. Here is a XML view of an SCM. Note the relation between SCM and pipeline material. Loosely typed property, key and value tags are used for SCM configuration in order to accommodate different plugins. If you choose to configure via direct XML edit, note that it isn’t necessary to provide SCM IDs, GoCD server wil auto-generate them. However, not all validations that are performed while configuring via UI kick in while configuring via XML edit - the resulting failures will show up later in the server health message panel at the bottom right of the browser frame. Since SCMs are global entities changing a SCM definition will reflect on all pipelines that consume it - even those not in the same pipeline group as that of the person editing. To make the decision to “edit” / “remove” and “add” new material easier, we list all pipelines consuming the SCM. Note: Change to the SCM definition causes all dependent pipelines to schedule. Even if no pipelines use a SCM, GoCD polls for newer revisions every minute. This may be turned off at a SCM level by setting autoUpdate to false via the config xml (GoCD admins only). autoUpdate is turned on by default. When a newer revision is found for a SCM, the pipelines for which it is a material get scheduled (assuming auto scheduling of pipelines is on). Also see API scheduling. Filters: At times you may not want GoCD to trigger pipelines for every commit. e.g. you might not want to ‘build’ if its a ‘documentation’ change. You can setup a filter at pipeline level asking GoCD to skip pipeline scheduling if commit contains only files that match a pattern. At the time of building the SCM, it is recommended to include as much of the above information as possible so that it is available for GoCD to display as below. VCS/SCM plugin will by default checkout code into destination directory on Agent before the job begins.